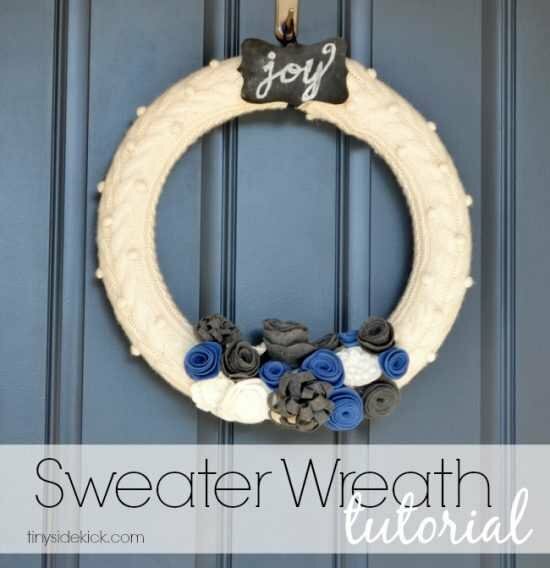 Inside: There are so many ways to use old sweaters to add texture and warmth to fall and winter decor! 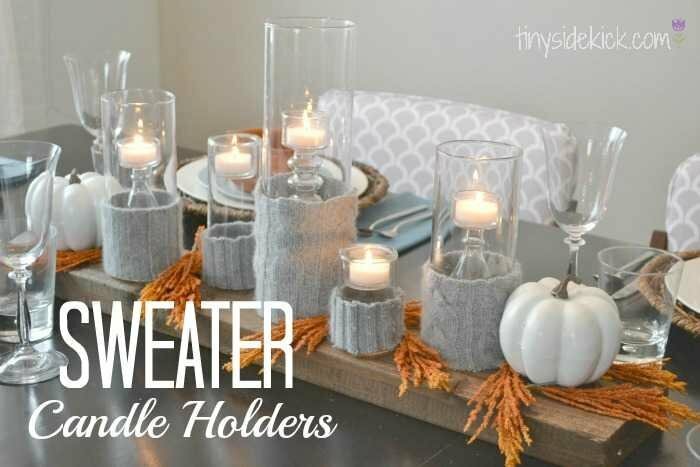 If you are a regular around here or follow me on Pinterest, you have probably noticed my recent love for sweater projects, like my DIY Sweater and Felt Wreath or the Sweater Candle Holders that I used for my fall centerpiece and then again on my winter table. I love the texture that sweaters have and using them in home decor warms up a space almost instantly. Plus they make for great pieces throughout fall and winter. So today I’m sharing some of my favorite Sweater Projects from around the web. Don’t throw out those old sweaters just yet…inspiration is on the way! 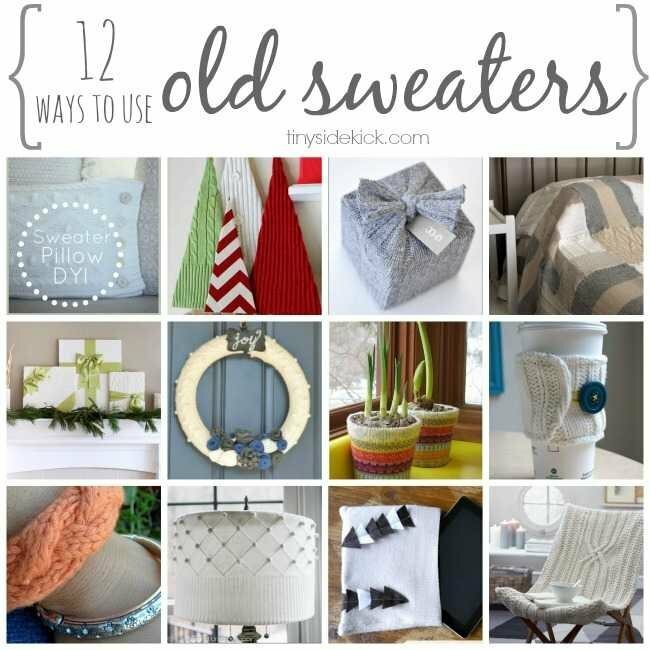 Who knew there were so many ways to use old sweaters? Let’s start with my favorite! How cool is this chair? The only thing better than wearing a cozy sweater might just be sitting in one. Makes me want to make a warm cup of tea and get cozy. Or how about covering an old lamp shade with a sweater. Beth at the Unskinny Boppy does the texture perfectly here by using the part of the sweater that has different patterns on it. I’m pretty sure I owned this sweater in the fourth grade. Wish I still had it because I love how colorful and unexpected it is when it covers planters! You would need a lot of sweaters to make this sweater patchwork blanket, but isn’t it awesome? One sweater adds texture to a space, but a bunch of different ones together is just awesome! I bet it is nice and heavy which would be so cozy on cold nights. Adding sweater throw pillows, especially in crisp white screams winter and cozy don’t you think? Now this is a project that is totally doable. And we can’t forget about Christmas decorations. I love this mantel with sweater wrapped presents. It is clean and modern because of the monochromatic color, but so interesting with the textures. And while we are in Christmas mode, check out these Sweater Trees! A great use for bright colored sweaters. If I were to get this as a gift, I don’t even think I would care what was inside. I just love the way it looks all wrapped up! Speaking of gifts! This sweater i-pad cover would make a great gift…and cost nothing! I don’t know how to knit, so now knowing that I can still make one of these adorable coffee cozies might just mean someone is getting one of these in their stocking this year! Here are my 2 sweater projects so far…but I think I might be hooked. I hope you are enjoying winter and finding ways to be cozy! Now go cut up some old sweaters already! Such great Ideas! I’ve always loved all those cozy knit textures, and the chair and lampshade are especially awesome! Oh, fun, these are some great ideas! Thanks for sharing! Thanks so much for including me and my iPad cover in your round up! LOVE that sweater chair too! What a fantastic roundup! These ideas are wonderful! I’m going to have to pull out my old sweaters. Thanks for sharing! There are so many great ideas here! I am definitely pulling out my old sweaters to put them to new uses. These are all so creative! I haven’t seen a lot of these ideas before. Thanks for sharing! I want to make all of them! Such brilliant ideas! I love the Christmas trees! Unfortunately I just gave our old sweaters to Goodwill, but I will keep these in mind for the future for sure. Thanks for sharing! I love these sweater projects Corey – I tried a DIY sweater pillow but unfortunately it ended up in my garbage:) Maybe it is worth try two! Definitely give it another try. I found that the thicker (stiffer) sweater work the best. Who wants to wear those anyway…might as well make them into something beautiful! Thanks for stopping by Krista. Love all of these ideas, Corey! I don’t have enough old sweaters, so I need to go thrifting. 🙂 And did you really have that sweater? That is so funny! I’m pretty sure I had a similar sweater in Elementary school. I know…you are probably thinking I was the coolest kid ever! HA!